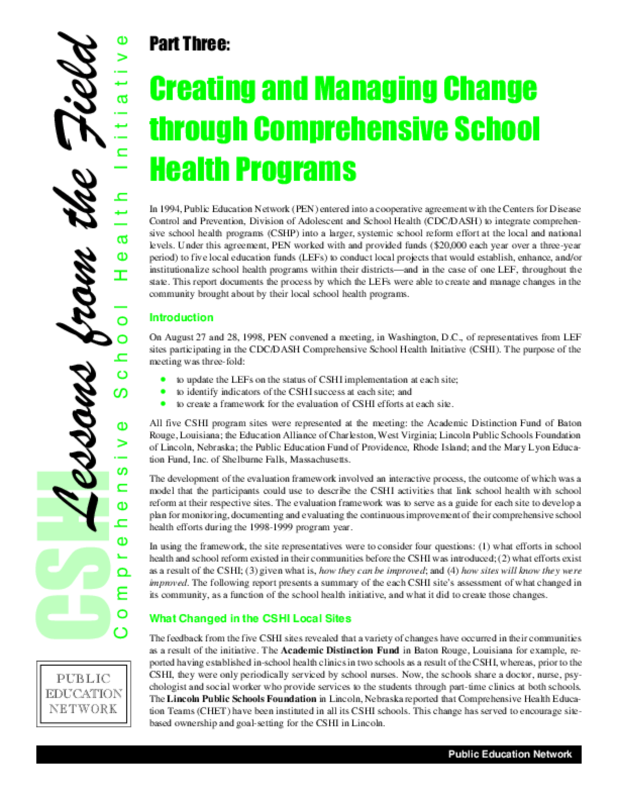 In 1994, Public Education Network (PEN) entered into a cooperative agreement with the Centers for Disease Control and Prevention, Division of Adolescent and School Health (CDC/DASH) to integrate comprehensive school health programs (CSHP) into a larger, systemic school reform effort at the local and national levels. Under this agreement, PEN worked with and provided funds ($20,000 each year over a three-year period) to five local education funds (LEFs) to conduct local projects that would establish, enhance, and/or institutionalize school health programs within their districts -- and in the case of one LEF, throughout the state. This report documents the process by which the LEFs were able to create and manage changes in the community brought about by their local school health programs.